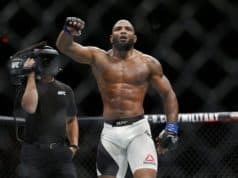 Undefeated at 6-0 in the UFC, surging middleweight bruiser Yoel Romero picked up what ranks as by far his biggest-ever mixed martial arts (MMA) win when he starched former light heavyweight champion Lyoto Machida in the main event of tonight’s (Sat., June 27, 2015) UFC Fight Night 70 from the Seminole Hard Rock Hotel and Casino in Hollywood, Florida. ‘The Soldier of God’ came and surprised many by standing and trading for the entire first two rounds, nailing ‘The Dragon’ with several hard shots and kicks. But Romero ended up finishing the bout with his Olympic medal-winning wrestling pedigree when he grounded Machida with a textbook takedown in the third round to absolutely batter the decorated veteran with an barrage of elbows that unfortunately sent to his second straight devastating stoppage loss. With the huge win, Romero could be finally headed for a fight with his previously scheduled foe Jacare Souza. Although the same might not be able to be said for his post-fight speech, Romero looked nothing short of amazing in defeating a legend of MMA. Watch the full fight video highlights of Romero’s violent victory above.